I was visiting business banks – the likes of Goldman Sachs, Morgan Stanley and Barclays – in The City of London one particular week in 2008. While bankers kept spirits as high as spending levels at first, meetings were shortened or cancelled later in the week. I was witnessing the pinnacle of the financial crisis in the very heart of London, arguably the most interesting week in the business banking world in the past 80 years. The subprime mortgage market was a major cause of this crisis. Chances are the next crisis will focus on cities, because we will soon see the end of urbanization. Urbanization has been happening for decades with good reason: cities provide numerous benefits to people. You wouldn’t see large factories running at full speed filled with hundreds of workers in the midst of vast nothingness. Commuting, transportation time and costs of both raw materials and finished goods would be problems. Proximity lets you reduce commuting time and expenses. The more people who live nearby, the larger your sales market is. Cities also offer job and education opportunities as stores, service providers and factories are nearby. When more people live close together economies of scale can be achieved, allowing for more educational variety. Proximity also allows the cost of infrastructure, such as roads, sewers and electricity lines, to be shared. This culminates in cities becoming magnets of wealth, money, services, opportunities and people. Doesn’t that mean we will continue to live in cities? I think not, because of the fourth industrial revolution. The need for proximity will decline as physical production is replaced by robots, whether that’s surgeons working from a distance, online versus real-life dating or online shopping and 3D-printing of purchases or even a whole house. Though the delivered-to-your-doorstep market for goods and food is growing, we do not need roads, just transportation, whether by drone, taxi or flying car. Privileged people now receive potable water from the tap. Decentralised alternatives can harvest water from the air and create clean water in substantial quantities. Decentralised sewer systems can take care of sewage. We can generate electricity with solar panels, wind turbines and living plants – all examples of distributed power generation supplying enough electricity to fuel your tablet, bake a cake, warm your house and charge your flying car. Back in 1999, many people thought mobile phones were a stupid idea. Going wireless with the Internet of Things seems to be the future. Smartphones are now unequivocally present and are replacing landlines. With 4G and the 5G standard-to-come, virtual proximity will reach a whole new level through virtual and augmented reality beyond our current apps. Education will benefit: with massive Open Online Courses (or MOOCs) anyone with an internet connection can absorb knowledge without being physically present. Lastly, automation and robotization will undoubtedly have major implications for both low and high-skilled work with about half of the jobs susceptible to computerization. New jobs will surely be created by technology – yet the number of jobs created is estimated to be about 30% of the jobs lost as a result of technological advances. This will leave many people jobless, but this not need be an issue if we get a universal basic income. With the changing nature of work and working from a distance or increased mobility options making geography increasingly irrelevant, why live in an expensive city with little space for becoming self-sufficient? The Fourth Industrial Revolution provides solutions for proximity in terms of infrastructure, work and education – exactly the things to which urbanization seemed to be the answer – and allows for a decentralized or distributed world. A world of deurbanization. Removing the advantages of city-living leaves only its disadvantages, such as 24/7 stress (with adverse health effects), higher household expenditure and little available space for becoming self-sufficient with regards to fresh produce or power generation. If you are just about managing and living on the fringe of society, you risk social exclusion. Without a clear way out, this causes hopelessness which is a breeding ground for many of the problems cities face today. But the problems don’t end there. Cities can form urban heat islands. Simply put, this means urban areas become much warmer than their rural surroundings. Dark surfaces absorb sunlight more effectively and the thermal properties of concrete and asphalt mean they contain far more heat than plants. Plants cool their surroundings through evapotranspiration; concrete and asphalt are unable doing this. Heat islands decrease air and water quality. London air, for example, is so bad that it broke annual legal limits for air toxicity just six days into 2017. The rise of electric cars will diminish car exhaust fumes which will help to improve air quality, but people also exhume pollutants. There is, however, a considerably worse downside beyond degrading air and water quality: heat kills. Take the August 2003 heatwave which killed about 70,000 people all over Europe. Heat is deadly if temperature and humidity combine to prevent a body from being able to cool down over time. Today, around 30% of the world’s population is having to deal with a potentially deadly combination of temperature and humidity for at least 20 days a year. Research suggests some cities could be as much as 8℃ warmer by the end of the century. This significant rise is not fully caused by the urban heat island effect – up to five of the eight degrees are because of climate change. The rest is caused by the urban heat island effect, which could be reduced by tree canopy cover or vertical forests (amongst other mitigation options), but it is unlikely that the effect can be completely neutralized. The result of the rising heat would be that about 75% of the world’s population will have to endure deadly temperaturesfor at least 20 days a year. Heatwaves in urban areas are simply hotter and therefore more dangerous. Another challenge is that sewers are badly suited for dealing with record amounts of rain in short periods of time. As a result, we are seeing floods in cities all over the world. We have to adapt our infrastructure in order to deal with this changing rainfall. 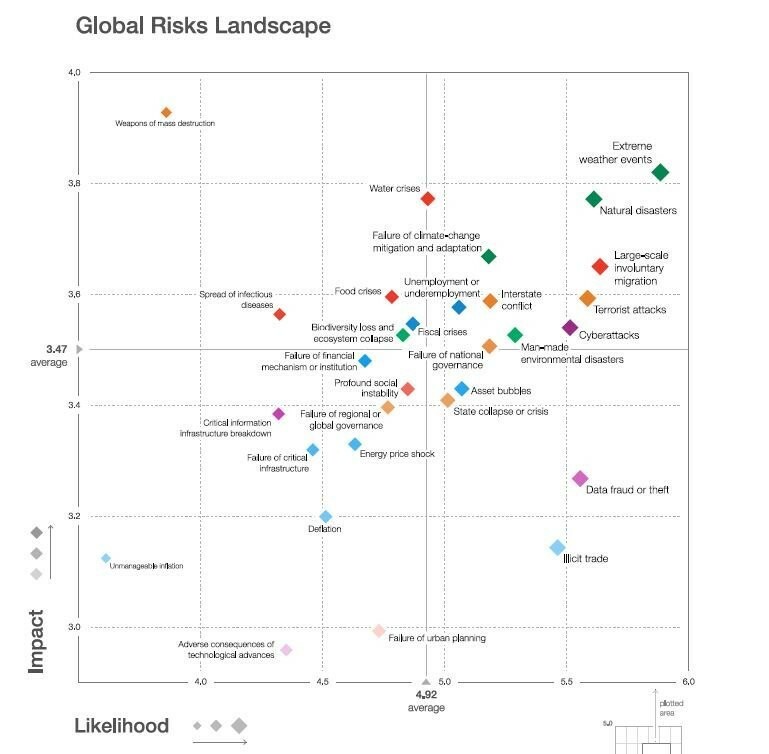 While the Global Risks Report suggests that climate change is perceived as the biggest global threat, it is not recognized as the largest local threat. This shows a lack urgency and doesn’t bode well for cities built right next to the sea, such as Amsterdam. 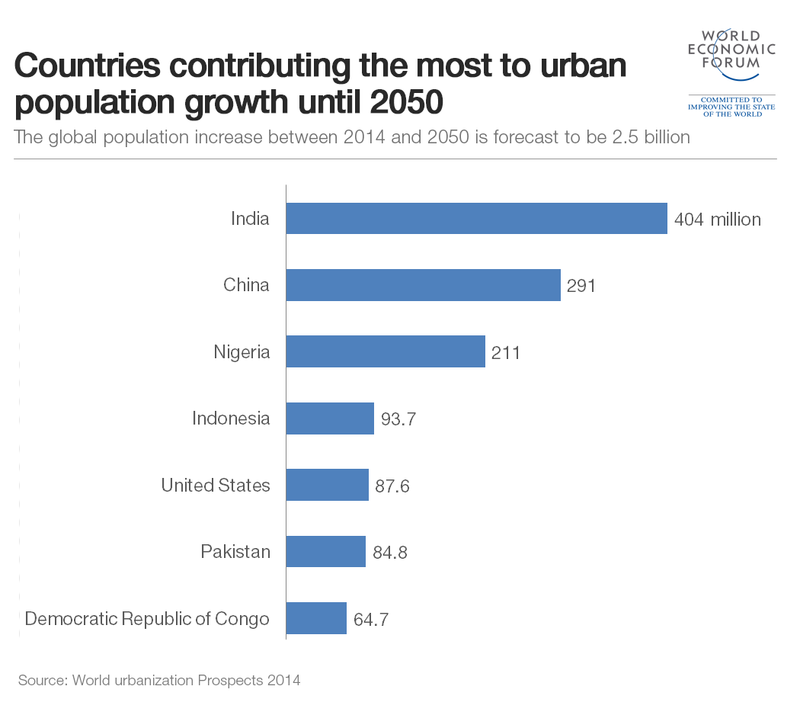 While the world is still in the urbanizing upswing, not every city is growing. Some cities in Japan, China, Latvia and Bosnia & Herzegovina have declined between 8.5% and 15% between 2005 and 2015. Cities in the German industrial heartland and the US rust-belt have also shrunk. The reason for this decline is deindustrialization – the removal of manufacturing and heavy industry. The departure of large employers from an area can impoverish whole cities. This starts a vicious circle involving falling housing demand and prices, a lack of money to maintain properties and declining tax incomes. The result is reverse gentrification. With automation and artificial intelligence leading to large job reductions in many industries, we may expect to see more shrinking cities. The specific composition of a city affects how much it is at risk of job losses and therefore the shrinking risk is dissimilar for cities. Take the US, where Boston tops the list of least at risk from job losses as a result automation of (“only” 38.4% of the city’s jobs are at risk, compared to Fresno where the risk is 53.8%). Some countries face much higher potential job losses – China (77%), India (69%) and South Africa (67%). It remains to be seen how cities and countries can and will deal with sudden declines in industries and try to prevent reverse gentrification. Why would we move into close quarters when the technologies enabling self-sufficiency just need a little more space? Why would we pay a lot of money to live closely together and not reap the benefits? Yet it seems that almost everybody in the world assumes urbanization will continue and continue. I am very enthusiastic about the possibilities of the technologies I have described. Technological advancements will enable self-sufficiency and this makes centralization – and thus cities – unnecessary. We shouldn’t forget that we are happiest when submerged in nature. It seems counterintuitive to continue moving into cities when many of our goals are aimed at self-sufficiency, while cities just give us downsides. Everything is becoming decentralized or distributed, the same will happen to cities. Even if your own job or family’s income wouldn’t be affected by shifts in technology, reflect upon shrinking cities. While the advantages of a city may outweigh the disadvantages for you personally, it won’t for everybody. We have moved towards cities because that’s where the opportunities used to be. The opportunities of the future will be somewhere else.